(WASHINGTON)— The Federal Highway Administration (FHWA) Nov. 14 said it would amend or repeal a century-old regulation related to the development and deployment of new products on U.S. transportation projects. The agency’s move comes in response to a March 27 filing from the Washington, D.C.-based American Road & Transportation Builders Association (ARTBA), which noted the Woodrow Wilson administration era-rule is today impeding innovations that could save lives, minimize congestion, or otherwise improve the quality of the nation’s highways. 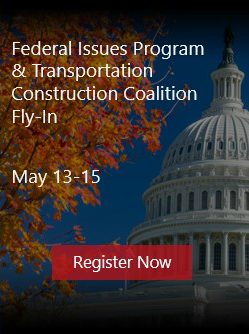 At issue is 23 CFR 635.411, a federal regulation that prohibits state and local governments from using patented or proprietary products on highway and bridge projects that receive federal funding unless those products qualify for limited exceptions. It was adopted in 1916 by the U.S. Department of Agriculture, which then managed the emerging federal-aid highway program, over the strong objections of both the American Road Builders Association, as ARTBA was then known, and the American Association of State Highway Officials. ARTBA’s March petition argued the rule was not directed by the governing statute, the 1916 Federal-Aid Road Act, nor was it ever subject to the Administrative Procedures Act’s rigorous public notice and comment requirements. There also does not appear to be any factual record or official federal proceedings to support an objective rationale for the rule, the association said. Other federal agencies, including the U.S. Department of Defense, the Coast Guard and the National Aeronautics and Space Administration, have set up procurement systems that allow for the appropriate use of sole source contracts for patented or proprietary products to accomplish their missions. ARTBA cited examples within the area of transportation construction, including the use of composite materials and disc bearings for bridges, moveable traffic barriers, higher visibility signage and breakaway sign posts. FHWA’s proposal recognizes ARTBA’s call for change in order to spur innovation and offers to either amend or repeal the rule. The agency will accept comments through Jan. 14, 2019, before taking any final action. ARTBA will continue to push FHWA for a full repeal and will encourage its member firms and agencies to submit comments urging the same. Established in 1902, ARTBA represents the U.S. transportation construction industry before Congress, the White House, federal agencies, courts, news media and the general public.